Near the end of last year, Apple CEO Tim Cook said that 2015 was the company’s “most successful year ever” with $234 billion of revenue. The numbers were impressive. 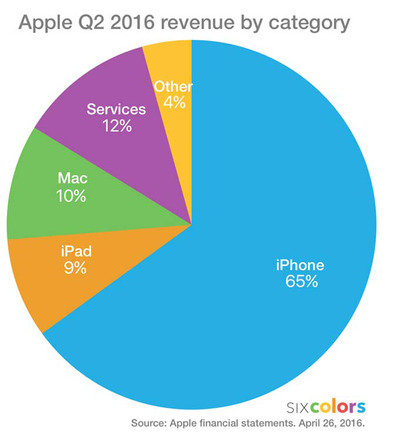 About 48 million iPhones were sold in Q4 for a 36% increase in sales over the same quarter in 2014. The company’s solid financial position was underlined by its war chest of $205 billion in cash. Investors were delighted, and the stock ran to $120 per share, which is close to its all-time highs. An over-reliance on iPhone sales is ok if the smartphone category is booming — but financials from Q2 in 2016 provided a wake up call to investors on Apple’s future potential iPhone prospects. Sales for the company’s flagship product declined by 16% from the quarter a year ago, and revenue fell with it by 13%. Despite this drop, iPhone sales still made up 65% of Apple’s entire revenue for the quarter. It’s now clear to investors that perhaps there is a ceiling for iPhone sales in the future — and even if it isn’t here yet, it raises the urgent question of what Apple’s next big ticket product will be. One area to look at may be the company’s “Other Products” category, which is growing fast with 29% in quarterly revenue growth year-over-year. Comprised of the Apple Watch, Apple TV, Beats headphones, and other hardware products, could this hold the next golden goose? Right now, it’s not looking like it, as this entire group of products amounted to only $2.2 billion of revenue in Q2, equal to a measly 4.3% of iPhone sales for the same time period. Even if the “Other Products” category continues to grow at a 30% clip, it will be over 10 years before it makes a significant dent on the income statement relative to the might of the iPhone. If the next hit isn’t in Apple’s product offering today, then hopefully it is still behind closed curtains. After all, Tim Cook has hinted that there are plenty of innovative products in store. The fact that Apple has been working on an electric car has been one of the tech giant’s worst-kept secrets. MacRumors even has an entire microsite dedicated to the potential project. However, not expected to launch until 2020, will the Apple car be early enough for investors to ward off the effect of plateauing iPhone sales? Apple’s virtual reality game hasn’t been particularly impressive, either. While it has patented a VR headset to work with smartphones and there is mounting evidence that Apple is making a significant bet on VR, the company is still considered to be “behind” leaders such as Facebook’s Oculus Rift or HTC. That’s because Apple does not have a VR/AR product or an articulated strategy in the sector — not yet, anyways.